The DRF series DIN rail signal conditioners are designed to accept a broad range of input signals, such as ac and dc voltage and current, frequency, temperature (thermocouple and RTD), and process transducers, and provide standard process outputs of either 4 to 20 mA, or 0 to 10 Vdc. The DRF series feature a modern housing design, that is easily mounted on standard 35 mm DIN rails. Connections are safely and securely made through pluggable screw terminal connectors, with input and output connections on the opposite sides of the module. 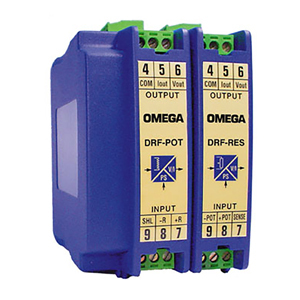 The DRF-RES and DRF-POT signal conditioners accept resistance and potentiometer input respectively and provide an isolated 0 to 10 Vdc or 4 to 20 mA output. The DRF-RES is available with four standard ranges from 0 to 1500Ω to 0 to 10,000Ω. The DRF-POT can work with a variety of potentiometers from 100Ω up to 1 MΩ. Models are available with three different power options, 24 Vdc, 120 Vac and 240 Vac. The DRF-RES and DRF-POT are ideally suited for industrial applications. All models mount on a standard 35 mm DIN rail and provide galvanic isolation between input, output and power up to 3500 Veff (model specific). Module response time is 70 ms or less. Maximum Voltage Output: 11 Vdc approx. Minimum Voltage Output: -1 Vdc approx. Minimum Load Resistance (Voltage): >1 KΩ Maximum Current Output: 22 mA approx. Maximum Current Output: -1.5 mA approx.